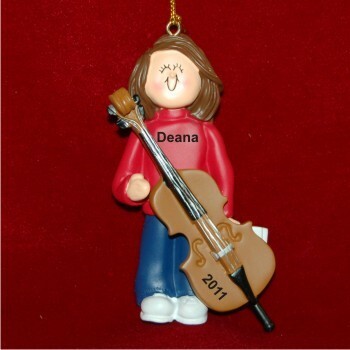 Show your support for a young player or celebrate the growth of an accomplished one with the cello virtuoso female brown hair personalized Christmas ornament from Russell Rhodes. It is part of a large series of musical instrument ornaments with lots of different instruments as well as looks to the players. We attach a golden display cord, so hanging the brunette female cello player personalized Christmas ornament wherever it makes her happy is quick and easy when she receives it in our lovely velvet drawstring bag.